The transnasal-sublabial approach to the pituitary has undergone an evolutionary refinement and today remains probably the most commonly used approach to selected pituitary tumors. The following article describes the history, technique, and complications of this useful surgical approach. The evolution of the transnasal-transseptal approach to the pituitary traces its lineage and subsequent reintroduction to sequential developments in rhinosurgical and neurosurgical techniques. In 1909, Hirsch combined the septal-submucous resection (as reported by Killian and Hajek's sphenoid sinusectomy) into a submucosal-septal approach to the sphenoid. Halstead first described using a gingivolabial incision to approach the septum, incorporating the upper lip and nose as a composite flap. In 1914, Cushing combined the gingivolabial incision and submucous resection as an approach to the pituitary. However, Cushing eventually abandoned the transseptal procedure, citing the high risk of intracranial contamination that likely results from direct contamination by the nasal vault. In Paris, Guiot reported success using the transseptal approach, following the influence of Cushing's pupil, Dott. [4, 5] Hardy subsequently reintroduced the transseptal procedure to North America. Combined with the advent of antibiotics, the use of intravenous steroids, and the technological advancements in the use of the operating microscope, the transseptal approach to the pituitary remains the most popular approach today. The normal median sagittal nasal anatomy is shown in the image below. Normal median sagittal nasal anatomy. Coronal and median sagittal images of pituitary adenoma. The sphenoid sinus begins as an evagination of the sphenoethmoidal recess during the fourth month of fetal life. Following the third year of life, the sinus begins to excavate into the pneumatizing sphenoid bone. This process progresses in the child from age 5-7 years. The adult size is not reached until age 18 years. The extent of pneumatization by the sinus into the sphenoid bone varies greatly. The capacity of the sinus varies from 0.5-30 mL. Hamberger in 1961  and Congdon in 1930  classified 3 differing types of sella pneumatization, and each is conceptualized by the position in relation to the sella turcica. The presellar type (23%) has its posterior wall in contact with the anterior face of the sella. The sellar or postsellar type (67%) appears when the sinus extends posteriorly beyond the sella to the pons. The conchal type (5%) is similar to the presellar type, except that the most posterior part of the sinus is well anterior to the sella turcica. The paired sphenoid sinuses rarely are symmetrical in size and have an intersinus septum that may be near horizontal in its orientation. This position renders the 2 sinuses in an over and under orientation, rather than in a lateral orientation. Important central nervous system, neurologic, and vascular structures surround the sphenoid sinus. Superiorly, the middle cranial fossa and the pituitary gland are in approximation to the sinus, while anterosuperiorly, the optic nerve and chiasm lie over the sinus. 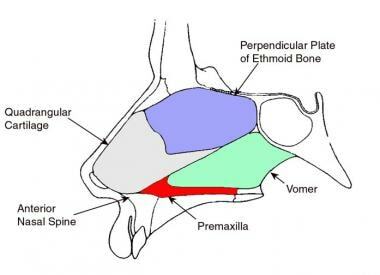 Anteriorly, a lateral margin of the sphenoid bone forms a portion of the posterior orbital wall, and the anterior sphenoid forms a crest that articulates with the perpendicular plate of the ethmoid bone. The sphenoid ostia are located above the superior turbinate at approximately one-half the length from the anteroinferior-most border of the sinus. The ostia drain into the posterior aspect of the sphenoethmoidal recess. Laterally, the carotid artery may indent the sinus wall posteroinferiorly or even lie within the sinus, directly contacting the sinus mucosa. Likewise, the contents of the cavernous sinus, including the oculomotor, trochlear, and abducens nerves and the ophthalmic and maxillary branches of the trigeminal nerve, contact the lateral wall of the sinus. Inferiorly, the roof of the nasopharynx and the neurovascular anatomy of the pterygoid canal are found. The inferior surface forms the sphenoid rostrum and articulates with the vomer bone. Posteriorly, through the thick bony wall, the pons and basilar artery are located. Hirsch O. Eine neue methode der endonasalen operation von ypophysentumoren. Wien Med Wochenschr. 1909. 59:636-638. Halstead AE. Remarks on the operative treatment of tumors of the hypophysis: with a report of two cases operated on by an oro-nasal method. Surg Gynecol Obstet. 1910. 10:494-502. 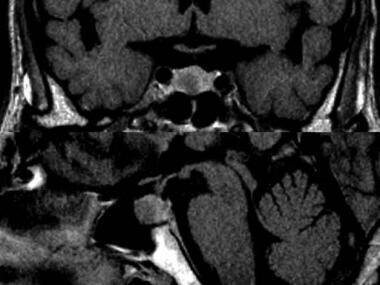 Cushing H. Surgical experiences with pituitary disorders. JAMA. 1914. 63:1515-1525. Guiot G. Indications for the trans-sphenoidal approach of the hypophyseal fossa. Rhinol. 1973. 11:137-152. Dott N, Bailey A. A consideration of the hypophysial adenomata. Br J Surg. 1925. 13:314-366. Hardy J. Transsphenoidal hypophysectomy. J Neurosurg. 1971 Apr. 34(4):582-94. [Medline]. Hamberger CA, Hammer G, Norlen G, Sjogren B. Transantrosphenoidal hypophysectomy. Arch Otolaryngol. 1961 Jul. 74:2-8. [Medline]. Congdon ED. The distribution and mode of origin of septa and walls of the sphenoid sinus. Anat Rec. 1930. 18:97. Mattogno PP, Mangiola A, Lofrese G, Vigo V, Anile C. Efficacy of Microsurgical Sublabial Approach (MSA) Versus Endoscopic Endonasal Approach (EEA) for the Treatment of Pituitary Adenomas Based on Radiological and Hormonal Outcome. Acta Neurochir Suppl. 2017. 124:101-6. [Medline]. Lazaridis N, Natsis K, Koebke J, Themelis C. Nasal, sellar, and sphenoid sinus measurements in relation to pituitary surgery. Clin Anat. 2010 Sep. 23(6):629-36. [Medline]. Chole RA, Lim C, Dunham B, Chicoine MR, Dacey RG Jr. A novel transnasal transsphenoidal speculum: a design for both microscopic and endoscopic transsphenoidal pituitary surgery. J Neurosurg. 2011 May. 114(5):1380-5. [Medline]. Duz B, Harman F, Secer HI, Bolu E, Gonul E. Transsphenoidal approaches to the pituitary: a progression in experience in a single centre. Acta Neurochir (Wien). 2008 Nov. 150(11):1133-8; discussion 1138-9. [Medline]. Neal JG, Patel SJ, Kulbersh JS, Osguthorpe JD, Schlosser RJ. Comparison of techniques for transsphenoidal pituitary surgery. Am J Rhinol. 2007 Mar-Apr. 21(2):203-6. [Medline]. Fujimoto Y, Balsalobre L, Santos FP, Vellutini E, Stamm AC. Endoscopic combined "transseptal/transnasal" approach for pituitary adenoma: reconstruction of skull base using pedicled nasoseptal flap in 91 consecutive cases. Arq Neuropsiquiatr. 2015 Jul. 73 (7):611-5. [Medline]. Hong SD, Nam do H, Seol HJ, et al. Endoscopic binostril versus transnasal transseptal microscopic pituitary surgery: Sinonasal quality of life and olfactory function. Am J Rhinol Allergy. 2015 May-Jun. 29 (3):221-5. [Medline]. Takemura M, Fujimoto Y, Kobayashi T, et al. A modified combined transseptal/transnasal binostril approach for pituitary lesions in patients with a narrow nasal space: technical note. Neurol Med Chir (Tokyo). 2014. 54(8):622-8. [Medline]. Er U, Gürses L, Saka C, Belen D, Yigitkanli K, Simsek S, et al. Sublabial transseptal approach to pituitary adenomas with special emphasis on rhinological complications. Turk Neurosurg. 2008 Oct. 18(4):425-30. [Medline]. Gammert C. Rhinosurgical experience with the transseptal-transsphenoidal hypophysectomy: technique and long-term results. Laryngoscope. 1990 Mar. 100(3):286-9. [Medline]. Elevation of septal mucoperichondrial-periosteal flap. Coronal view of septal mucoperichondrial flap elevation. Elevation of discontinuous septal mucoperichondrial and nasal floor mucoperiosteal flaps. Continuous septal mucoperiosteal and nasal floor mucoperiosteal flaps. Continuous septal and nasal flaps and contralateral nasal floor flap. Transection of septal cartilage, vomer, and ethmoid bones. Insertion of speculum through gingivolabial incision. Placement of speculum after removal of septal cartilage and bone. Medialization of nasal floor flap.